A passenger plane of the US-Bangla Airlines, flying to Kathmandu from Dhaka, crash-landed and exploded into a ball of flame on Monday at the Tribhuvan International Airport (TIA), in Nepal’s capital Kathmandu, authorities said. Of the 71 people on board, as many as 49 were killed and 22 injured in the crash. The death toll in the crash was confirmed by Nepal Police spokesperson Manoj Neupane. The aircraft caught fire after it skidded off the runway at TIA while landing. Subsequently, the plane crashed in a field, apparently due to technical glitches. The crash is being described as Nepal’s worst aviation disaster in over 25 years. Condoling the bereaved families, Nepalese Prime Minister Khadga Prasad Sharma Oli tweeted that his government would “investigate the incident immediately”. Director General of Civil Aviation Authority of Nepal, Sanjiv Gautam, said that the plane lost control when it attempted to land on the runway. “The aircraft was permitted to land from the southern side of the runway flying over Koteshwor but it landed from the northern side,” said Gautam. He added that the aircraft might have sustained technical glitches. “We are yet to ascertain the reason behind the unusual landing,” he said. On Monday, India condoled the loss of lives in the Nepal airplane crash and offered any assistance required. The US, too, offered its sincere condolences to the families and loved ones of the victims who were killed in the plane crash at Kathmandu’s Tribhuvan International Airport. The victims of the Kathmandu plane crash were citizens of Nepal, Bangladesh, China, and the Maldives, according to a TIA spokesperson. After the crash, all flights in and out of the Tribhuvan International Airport were cancelled. The airport was reopened later. 1) Death toll confirmed: According to updated figures, 49 people were killed and 22 injured when the US-Bangla Airlines passenger plane crash-landed and exploded at Nepal’s main airport on Monday. Nepal Police spokesperson Manoj Neupane confirmed the death toll. According to Neupane’s statement, 31 bodies were recovered from the wreckage of the crashed plane while 18 others died in hospitals. 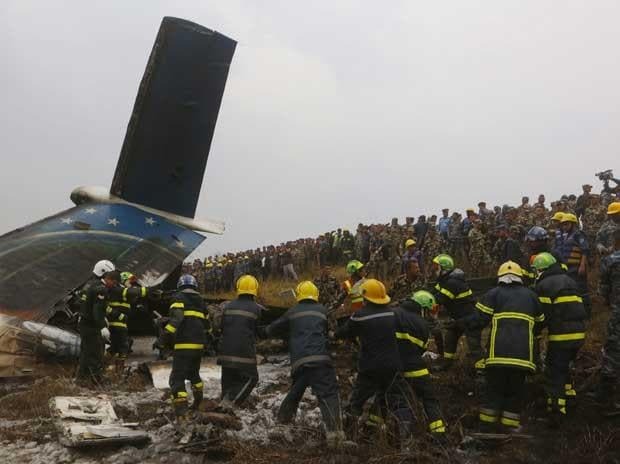 2) Nationalities of the deceased: The 78-seater Bombardier Dash 8 aircraft, which caught fire after it skidded off the runway at the Tribhuvan International Airport, was carrying 71 people.